Even though Dave and I began working on these new strips months ago, we’re still learning how to do things. Not just techniques, but ways to do artwork that we’re both satisfied with in a reasonable amount of time. This strip is a good example of adjustments that we’re making to speed up the process a bit. You may have noticed that the buildings in the second panel of page 4 were very different from those in the other panels and pages. Dave and I both liked the look of the buildings, and they were much faster and easier to draw while accomplishing more or less the desired effect of providing perspective, and depth. 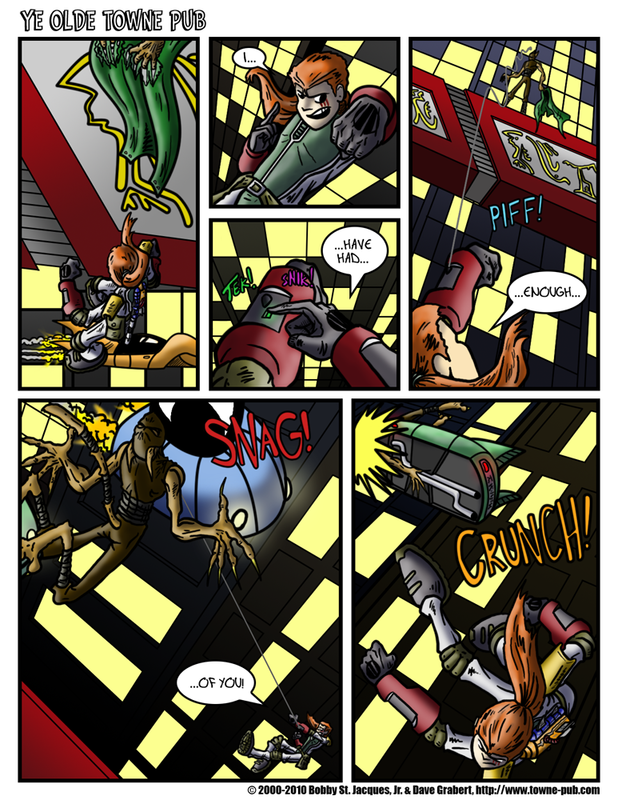 We decided to run with it in this strip and use the same (or a similar) style in every panel of the 5th page. The big problem is that this strip has a distinctly different look from the previous pages. I’m not sure how well it will flow, or how much it will matter, but I’m fairly happy with the result. What I am not happy with is that some of the panels look barren or blank. I feel like there should be flying cars in the backgrounds of some panels where there are none, and more in the backgrounds of panels that already have one or two. But I tried inserting some and it gave the panels a cluttered, busy feeling that didn’t help at all. Of all the pages posted so far, I have the most mixed feelings about this one. I’m absolutely thrilled with the foregrounds. I love Phinn in virtually every panel, and particularly the last which was a joy to draw. I hope you guys like it as well. As always, we’d love to hear your comments and feedback. One last thing: I would like to apologize for missing the Tuesday update this week. This week has been nuts. My wife works full time, as do I, but she also attends classes at RIT four nights a week and does not get home until well after 8. As a result, it’s up to me to help with homework, get the kids doing their chores, make dinner, and drive to and from after school clubs, classes, and other activities. This week was one of those perfect storm weeks were commitments to work, family, and the strip were difficult to balance. I hope you’ll forgive me. I plan on doing Tuesday updates whenever I can with behind the scenes updates, goodies, sketches, and other fun stuff. Ugh. The more I look at this strip, the more unfinished it feels. Don’t be surprised if I throw up a new version sometime this weekend Of course, I won’t do that until I’m finished inking strip 6. Just thinking if you want more in the panels how about stuff in some of the windows like people looking out or office stuff. The backgrounds already take me too much time to do, even simplified like they are in strips 4, 5, and 6. Adding that level of detail would probably drive me insane. If not, Dave would murder me for making him color it.